Sachin Ramesh Tendulkar : (Born 24 April 1973) is an Indian cricketer widely acknowledged as the greatest batsman in One Day Internationals and second only to Don Bradman in the all time greatest list in Test cricket.. In 2002, The Wisden ranked him the second greatest Test batsman of all time, behind Don Bradman, and the second greatest one-day-international (ODI) batsman of all time, behind Viv Richards. Tendulkar was a part of the 2011 Cricket World Cup winning Indian team in the later part of his career, his first such win in six World Cup appearances for India. He was also the recipient of "Player of the Tournament" award of the 2003 Cricket World Cup held in South Africa. Tendulkar won the 2010 Sir Garfield Sobers Trophy for cricketer of the year at the ICC awards. He has been recommended for the receipt of the Bharat Ratna award, in fact it has been speculated that the criteria for the award of the Bharat Ratna was changed to allow him receive the award.He is also a member of Rajya Sabha of Parliament of India.Tendulkar passed 30,000 runs in international cricket on 20 November 2009. On 5 December 2012, Tendulkar became first batsman in history to cross the 34,000 run aggregate in all formats of the game put together. At 36 years and 306 days, he became the first ever player to score a double-century in the history of ODIs. Two years later he became the first player to score 100 international centuries. 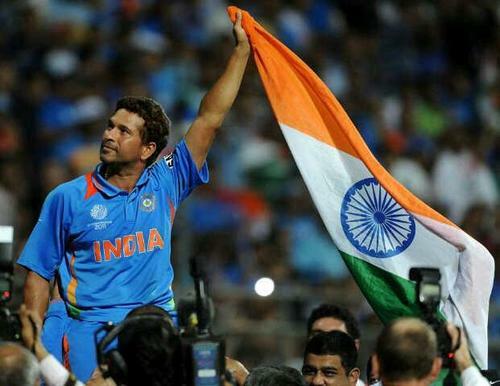 As of December 2012, Tendulkar has played 657 matches in international cricket. Tendulkar has been honoured with the Padma Vibhushan award, India's second highest civilian award, and the Rajiv Gandhi Khel Ratna award, India's highest sporting honour. He was also the first sportsperson and the first one without aviation background to be awarded the honorary rank of Group Captain by the Indian Air Force. Tendulkar has received honorary doctorates from University of Mysore and Rajiv Gandhi University of Health Sciences. Sachin holds the 18th rank in ICC Player Rankings for Test batsmen as of 4 December 2012. On 1 August 2012, Sachin Tendulkar was nominated for the ICC People's Choice award for the third time In 2012, he was nominated to Rajya Sabha, the upper house of the Parliament of India. Tendulkar was born on 24 April 1973 into a Rajapur Saraswat Brahmin family in Bombay (now Mumbai). His father Ramesh Tendulkar was a reputed Marathi novelist and his mother Rajni worked in the insurance industry.] Ramesh named Tendulkar after his favourite music director, Sachin Dev Burman. Tendulkar has three elder siblings: two half-brothers Nitin and Ajit, and a half-sister Savita. They were Ramesh's children from his first marriage. He spent his formative years in the Sahitya Sahawas Cooperative Housing Society, Bandra (East), Bombay. As a young boy, Tendulkar was considered a bully, and often picked up fights with new children in his school. [ He also showed an interest in tennis, idolising John McEnroe.] To help curb his mischievous and bullying tendencies, Ajit introduced him to cricket in 1984. He introduced the young Sachin to Ramakant Achrekar, a famous cricket coach of Bombay and a club cricketer of repute, at Shivaji Park, Dadar, Bombay. Achrekar was impressed with Tendulkar's talent and advised him to shift his schooling to Sharadashram Vidyamandir (English) High School, a school at Dadar which had a dominant cricket team and had produced many notable cricketers. Prior to this, Tendulkar had attended the Indian Education Society's New English School in Bandra (East).He was also coached under the guidance of Achrekar at Shivaji Park in the mornings and evenings.] Tendulkar would practice for hours on end in the nets. If he became exhausted, Achrekar would put a one-rupee coin on the top of the stumps, and the bowler who dismissed Tendulkar would get the coin. If Tendulkar passed the whole session without getting dismissed, the coach would give him the coin. Tendulkar now considers the 13 coins he won then as some of his most prized possessions. He moved in with his aunt and uncle, who lived near Shivaji Park, during this period, due to his hectic schedule. Meanwhile at school, he developed a reputation as a child prodigy. He had become a common conversation point in Mumbai cricketing circles, where there were suggestions already that he would become one of the greats. Besides school cricket, he also played club cricket, initially representing John Bright Cricket Club in Bombay's premier club cricket tournament, the Kanga League,and later went on to play for the Cricket Club of India. In 1987, at the age of 14, he attended the MRF Pace Foundation in Madras (now Chennai) to train as a fast bowler, but Australian fast bowler Dennis Lillee, who took a world record 355 Test wickets, was unimpressed, suggesting that Tendulkar focus on his batting instead. A couple of months later, former Indian batsman Sunil Gavaskar gave him a pair of his own ultra light pads. "It was the greatest source of encouragement for me," Tendulkar said nearly 20 years later after surpassing Gavaskar's world record of 34 Test centuries. His season in 1988 was extraordinary, with Tendulkar scoring a century in every innings he played. He was involved in an unbroken 664-run partnership in a Lord Harris Shield inter-school game against Anjuman-E-Islam High School in 1988 with his friend and team-mate Vinod Kambli, who would also go on to represent India. The destructive pair reduced one bowler to tears and made the rest of the opposition unwilling to continue the game. Tendulkar scored 326 (not out) in this innings and scored over a thousand runs in the tournament. This was a record partnership in any form of cricket until 2006, when it was broken by two under-13 batsmen in a match held at Hyderabad in India. On 14 November 1987, Tendulkar was selected to represent Bombay in the Ranji Trophy, India's premier domestic first-class cricket tournament, for the 1987–88 season. However, he was not selected for the final eleven in any of the matches. A year later, on 11 December 1988, aged just 15 years and 232 days, Tendulkar made his debut for Bombay against Gujarat at home and scored 100 not out in that match, making him the youngest Indian to score a century on first-class debut. He was handpicked to play for the team by the then Mumbai captain Dilip Vengsarkar after watching him easily negotiating India's best fast bowler at the time, Kapil Dev, in the Wankhede Stadium nets, where the Indian team had come to play against the touring New Zealand team. He followed this by scoring a century in his first Deodhar and Duleep Trophies, which are also Indian domestic tournaments. Tendulkar finished the 1988–89 season as Bombay's highest run-scorer. He also made an unbeaten century in the Irani Trophy match against Delhi at the start of the 1989–90 season, playing for the Rest of India. In 1992, at the age of 19, Tendulkar became the first overseas-born player to represent Yorkshire, which prior to Tendulkar joining the team, never selected players even from other English countiesSelected for Yorkshire as a replacement for the injured Australian fast bowler Craig McDermott, Tendulkar played 16 first-class matches for the county and scored 1070 runs at an average of 46.52. His first double century was for Mumbai while playing against the visiting Australian team at the Brabourne Stadium in 1998. He is the only player to score a century in all three of his domestic first-class debuts. Tendulkar's immense popularity has led him to be an early pioneer in India on cricket business dealings when he signed a record sports management deal with Worldtel in 1995, the value of the deal being INR30 crore (US$5.46 million) over five years. His next contract with WorldTel in 2001 was valued at INR80 crore (US$14.56 million) over five years. In 2006, he signed a contract with Saatchi and Saatchi's ICONIX values at INR180 crore (US$32.76 million) over three years. In 2007, Tendulkar also announced a JV with the Future Group and Manipal Group to launch healthcare and sports fitness products under the brand name 'S Drive and Sach'. [A series of comic books by Virgin Comics is also due to be published featuring him as a superhero. In April 2012, Tendulkar accepted the Rajya Sabha nomination proposed by the president. He is the first active sportsperson and cricketer to have been nominated to the Rajya Sabha. Reactions to this decision included: Sanjay Manjrekar who said that he was "actually shocked by the story itself, first by the nomination as it came without any warning. And that Sachin has accepted it is even more shocking. When I visualise what Sachin could possibly do after retirement, I thought something connected to cricket, coaching and all that, may be some business or social activity. But Rajya Sabha MP after retirement or even at this stage of career is something that was not even in my wildest guess." MP and former cricketer Kirti Azad said that the move was akin to an honourary degree on an eminent person and said that "Why should he not be successful? Unlike a Lok Sabha MP, he does not have to worry about his constituency and he could focus on the topics related to sports. I'm confident he will do a good job." Former Indian captain Dilip Vengsarkar reacted in saying that "so far, they were nominating persons from other fields. Now that a sportsman has been nominated to the Rajya Sabha, a good precedent has been set." DNA questioned if Tendulkar could handle the political system and was aware of the issues, though it also said that he has now outlined in partisan politics in choosing a party after the nomination followed a visit to the head of the Indian National Congress' residence in New Delhi at the behest of party MP Sanjay Nirupam. The nomination was also made by the president, who is a member of the INC, in the same year as she faces re-election. Actor Sanjay Dutt, who had also tried to become a MP, said that "it is an honour to be in the Rajya sabha. I am a fan of Sachin. He is the pride and jewel of India. But, I am not happy that he is a Rajya Sabha member. He should have been the way he is." He was also said to have the support of Amitabh Bacchan. His decision to be a MP was also criticised in some quarters: Former Indian captain Ajit Wadekar said that "hope[s Tendulkar] does not suffer the same fate as another legend, Amitabh Bachchan, politics is a big game. He had only said he is not going to retire soon. But, my fear is how will he divide his time and responsibilities." Former member of the Indian 1983 Cricket World Cup team Madan Lal was also surprised, saying that "the kind of person Sachin is, we never expected him to take up politics." The Maharashtrian party Shiv Sena's MP Sanjay Raut questioned the timing and asked "is Sachin being used to divert attention from the problems plaguing the Congress?" The Communist Party of India's Gurudas Dasgupta sad that "I welcome the decision to nominate Tendulkar, but at the same time when Sourav is in his top form, his name, too, should have been considered. "His current colleague Harbhajan Singh said that he was "proud that Sachin is getting the honour. He deserves much more than that. May God bless him always. "Anti-corruption campaigner Baba Ramdev said that the INC was using the nomination and Tendulkar's stature to boost its battered image through series of scandals and electoral defeats.Five-time World Chess Champion, Viswanathan Anand said "I hope he (Tendulkar) enjoys his role and he is able to do it very well. It's a big step for him and I think he will enjoy it".Former Indian football captain Baichung Bhutia reacted neutrally saying a nomination of a sports candidate was a personal choice to accept. On 2 May, Tendulkar was elected to seat number 103 in the Rajya Sabha. He took the oath as a member of the Rajya Sabha on 4 June; however he could not take the oath during the budget session due to the ongoing IPL. "Cricket comes first," Tendulkar said when reporters asked whether he preferred cricket to parliament.Sachin Tendulkar had been alloted 5 Tughlak Lane bungalow, a type VII accommodation in Lutyen's zone in New Delhi. The accommodation was just opposite to that of Rahul Gandhi's residence.However, he has politely turned down the offer. Sachin Tendulkar is the most prolific run scorer in one-day internationals with 18,426 runs. With a current aggregate of 15,470 Test runs, he surpassed Brian Lara's previous record tally of 11,953 runs as the highest run scorer in test matches in the second Test of Australia's 2008 tour of India in Mohali.Tendulkar described "It is definitely the biggest achievement in 19 years of my career" on the day he achieved the record.He also holds the record of highest number of centuries in both Test (51) and ODI (49) cricket.. On 16 March 2012, Tenduklar scored his 100th international hundred. It came against Bangladesh in the league matches of Asia Cup 2012. Throughout his career, he has made a strong impact on Indian cricket and was, at one time, the foundation of most of the team's victories. In recognition with his impact on sport in a cricket-loving country like India, Tendulkar has been granted the Rajiv Gandhi Khel Ratna, Arjuna Award, Padma Shri and Padma Vibhushan by the Government of India. He was also chosen as one of the five Wisden Cricketers of the Year in 1997 and is ranked by the Wisden 100 as the second best test batsman and ODI batsman of all time. He has been Man of the Match 13 times in Test matches and Man of the Series four times, out of them twice in the Border-Gavaskar Trophy against Australia. The performances earned him respect from Australian cricket fans and players. Similarly he has been Man of the Match 60 times in One day International matches and Man of the Series 14 times.He is the leading run-scorer and century maker in Test and one-day international cricket.He is the first player to score a double century in Men's ODI cricket. He also holds the world record for playing highest number of Test and ODI matches. Tendulkar is the only cricketer to accomplish the feat of scoring a hundred centuries in international cricket which includes 49 ODI and 51 Test centuries.He is also the only player to score fifty centuries in Test cricket, and the first to score fifty centuries in all international cricket combined. On 17 October 2008, when he surpassed Brian Lara's record for the most runs scored in Test cricket, he also became the first batsman to score 12,000, 13,000, 14,000 and 15,000 runs in that form of the game, having also been the third batsman and first Indian to pass 11,000 runs in Test cricket. He was also the first player to score 10,000 runs in one-day internationals, and also the first player to cross every subsequent 1000-run mark that has been crossed in ODI cricket history. In the fourth Test of the Border-Gavaskar Trophy against Australia, Tendulkar surpassed Australia's Allan Border to become the player to cross the 50-run mark the most number of times in Test cricket history, and also the second ever player to score 11 Test centuries against Australia, tying with Sir Jack Hobbs of England more than 70 years previously.On 24 February 2010, Tendulkar became the first man to score a double century (200*) in an ODI against South Africa. On 8 November 2011, Tendulkar became the first batsman to score 15,000 runs in Test Cricket.